Throughout our 15+ years experience, our team at Florida State Fence has provided high-quality fencing to residential, commercial, and industrial clients throughout all of Tampa Bay and Lakeland. We have become one of the largest and most respected fence company in Central Florida, because of our dedication to customer satisfaction and incredible service. Our high-quality fences can add value and security to your home, as well as improving the home’s appearance. You can rest assured knowing that we are fully insured and licensed as fence installers in the State of Florida. In addition to residential vinyl and residential ornamental aluminum fencing, we also offer a full array of fencing options for residential, commercial, and industrial clients, including wood, chain link, and aluminum. Our wide variety of options enables us to customize your fence exactly to your specifications. Do You Need Fencing for Your Residential, Commercial, or Industrial Property? We have locations in both Tampa Bay and Lakeland and we live and work in the areas, and we care about our communities. All of our fences are 100% made in the USA as a result of manufacturing and fabricating our products locally. Each year we sponsor the Hyde Park pumpkin patch as well as donating to Big Brothers Big Sisters. Whatever your requirements are, we will take care of them in a prompt, courteous manner. 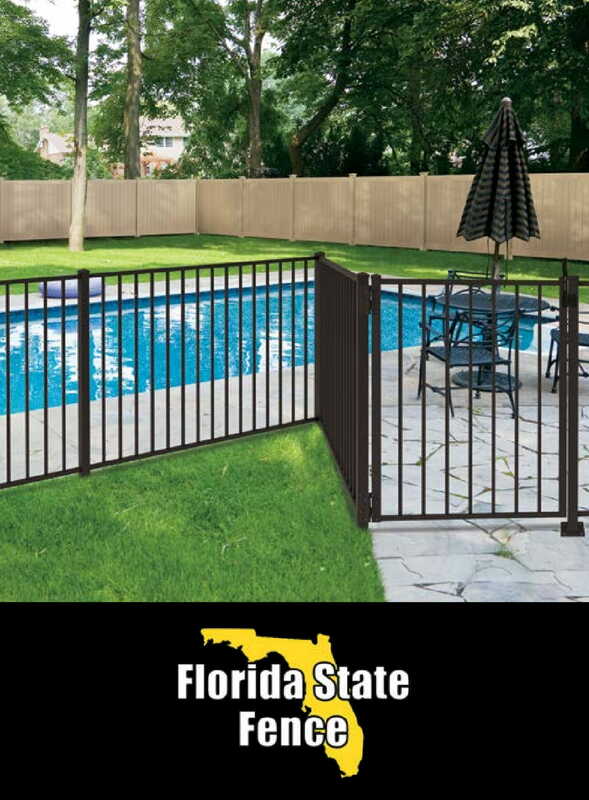 Florida State Fence offers personalized service that is timely, courteous, convenient, reasonably priced, efficient, and dependable. We truly care about and value each one of our customers, including you. Our community is very important to use, and we want to offer you the best. If you live or work in the Lakeland or Tampa areas and need fencing for your home, commercial building, or industrial facility, please give us a call today!